A Lime scooter in action during Lime's tutorial video. It looks like the electric scooter revolution has begun in Philadelphia. Brace yourselves. Thanks to an extremely observant tweet from Inquirer writer Tommy Rowan last night, two dockless Lime scooters were spotted in northeast Philadelphia last night. 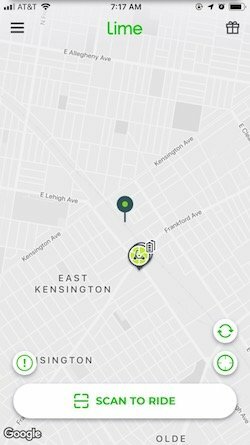 As of this morning, two scooters can still be found in Philadelphia on the Lime app, both parked just off East Lehigh Avenue up in East Kensington. They’re both fully charged as of 7:10 a.m. One has a range of 20.9 miles; the other has a range of 17.9 miles. Each scooter costs $1 to unlock, and then costs 15 cents per minute of use. 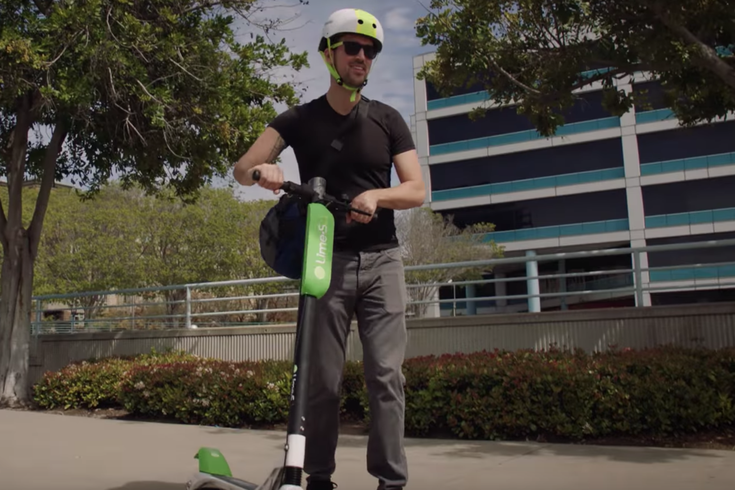 You use your cell phone to ride a Lime scooter. Just two scooters seems like a timid introduction into a city, but the closest official Lime location to Philadelphia listed on Lime’s website is Plainfield, New Jersey, some 80 miles away. Philadelphia is not yet listed on Lime's location page, but odds are good these are meant to be here, and they’re a sign of things to come. Back in June, Philadelphia City Council passed legislation that cleared the way for licensing and regulation of vehicles like Lime’s scooters, which have taken other cities across the country by storm. Dockless vehicles had a rough go just across the river in Camden, where a pilot program of dockless bikes from bike company Ofo was cut short after less than 100 days and 80 yellow bikes were left in a warehouse. Will Lime scooters fare better? Will Bird scooters follow soon? Who knows? It’s a whole new world.